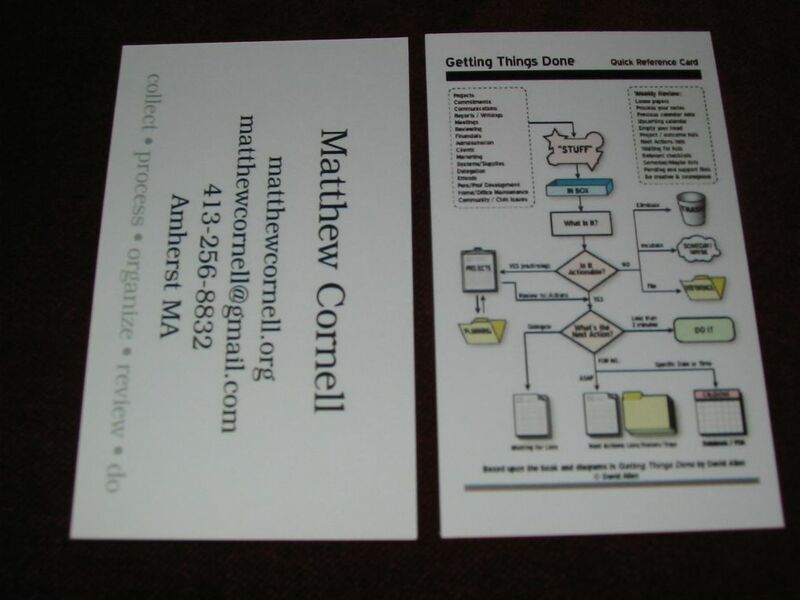 On the back (right hand side) is Doug Johnston's incomparable GTD Quick Reference Card, which includes "a flow chart, a weekly review list, and a list of 'Stuff' (TM, patent pending)". Rather than going for something traditional, I wanted to make a card that would a) draw some attention (Doug's images does so nicely - always good for a "cool! "), b) educate a bit about the Allen's work, and c) give me some visual GTD talking points. The diagram is small, but I'm using it both for a visual symbol (icon) as well as concepts for me to go over with interested folks. I've found that even if someone can't read the words, I know them, and can present the flow while talking and pointing to the boxes. Of course I always give appropriate credit to Allen and Johnston (thanks, guys). Great idea for a BC. I've some new developments on my side, but I'm too busy to post them now; maybe later in the day. Thanks, Ricardo. Looking forward to hearing about your ideas. I've posted about the changes on my implementation on my blog, if you want to take a look. Right now, I'm experimenting with a slightly non-standard approach to the tickler file, but I haven't got to any conclusion regarding its efficiency. Thanks for the pointer, Anonymous.